KoopaTV: Splatoon 2 is Released! By LUDWIG VON KOOPA - Must-buy game for the Switch, and my gameplay thoughts. Last Saturday, I actually began playing games on my new Nintendo Switch. I played The Legend of Zelda: Breath of the Wild, and then once it was around 6 PM Eastern, I spent my night playing the Splatoon 2 Splatfest demo. According to the Nintendo Switch Parental Controls app (it's substituting for an Activity Log), I played The Legend of Zelda: Breath of the Wild for 3 hours, and then the Splatoon 2 Splatfest World Premiere for 3 hours and 20 minutes. Of the two, I actually enjoyed Splatoon 2 more than I did with Breath of the Wild! As I wrote yesterday, I played just enough to become an Ice Cream King and not one match more, and I played as the Splat Roller the whole time. Here's how my Splat Roller was at the end. 24681p for Splat Roller. 0p for everything else. 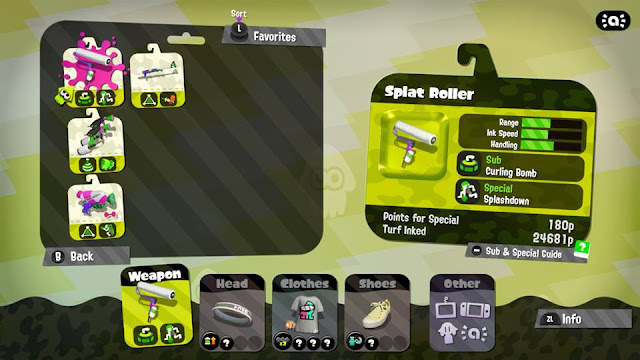 The big notable change to the Splat Roller, other than that it feels faster, is the vertical flick. The vertical flick enables your Inkling to fling a vertical spread of ink forward, as opposed to the horizontal swath. You'll flick vertically whenever you jump and then swing. If you still want to horizontally flick, you press the shoot button first. You can time it so you press the shoot button and then press the jump button, and you'll do a jumping horizontal flick. Either way, the vertical flick actually allows rollers to be able to take advantage of walls, rather than waiting for teammates to ink the walls for them. It came in handy for Inkblot Art Academy's centre. It also allows the rollers to be able to deal with flying folks. You know, those Inkjetters. I don't like inkjets in general, and that probably stems from my preference for laser printers. After reaching Ice Cream King, I tried the other weapons out in the recon mode. I'm still bad with chargers, and I won't ever like the slow speed of inking with the Splattershot. How did I like the Dualies? Well, not much. I did like that you could fast-fall with a combat roll, but the whole combat roll isn't intuitive in general. Speaking of falls, there's new specials! I mentioned the Inkjet, but I only actually used the Splashdown. It's basically a “get off me” option, though you're not invincible using it and it's pretty easy to avoid its splash. If two Splat Rollers were to Splashdown one another, the one that used the move first would come away the victor. You can use it out of a jump, though, including a fall. This is the only other picture I took during the Splatfest that hasn't already been published. Social media will love this picture of Marina! Anyway, Splatoon 2 released in stores today. I went over to Best Buy and purchased it. Now, two years ago, when I went to get Splatoon on release day, I had pre-ordered it only to see many copies of Splatoon on the shelf. This time, I didn't pre-order Splatoon 2. There were about 25 copies of Splatoon 2 on the shelf (5 columns with a depth of 5 each)... and 1 copy of ARMS hidden in the dedicated Splatoon 2 space. Is THIS how stores are trying to get rid of their excess ARMS copies? Trick people into thinking they're buying Splatoon 2? Sheesh. I also saw, in a hidden employee-only hallway, boxes of Corrin and Bayonetta amiibo literally behind a padlock in a cage. Serves ‘em right. Didn't see any sign of Cloud, though. Oh well! I own Splatoon 2 now. Now to play my Nintendo Switch a lot! One more positive thing from the Splatfest demo: I only played with people from North America, and I was actually better than them. It was much more relaxing and pleasant than the deathly turf wars in the first Splatoon where you can only find cutthroat Japanese people as your opponents. Ludwig played 4 hours of The Legend of Zelda: Breath of the Wild the day he wrote this article, which is why it was published at the last minute on Friday because he realised he needed to run back and publish this. For disclosure, Rawk told Ludwig not to even BUY Splatoon 2 until he played a lot more of Breath of the Wild. If you're wondering, here was Rawk feedback when he played the Splatoon 2 Global Testfire. One year later, and the whole Inkopolis Square is a disaster. Don't be a nerd, play Breath of the Wild. I saw it, you need to dedicate your life to it though. I... would really rather not. But it's a good game! They're, like, the same game. Less Japanese opponents is always a plus. I've been playing a lot of ranked battles lately, and there are very few Americans or Europeans that I battle against anymore. I miss the satisfaction of annihilating the other team. I'm gonna play Splatoon 2 today and see what happens! 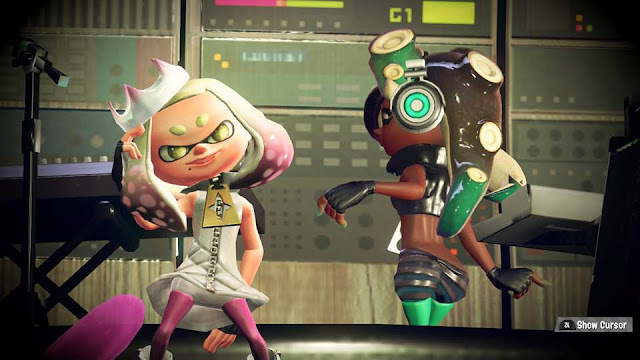 Marina matches her body language in the Japanese version and is actually shy and respectful to Pearl because she is a lone Octolin in a majority of Inklings. Nintendo of America really wanted Marie 2.0 for Marina. Probably why she's named Marie-na.